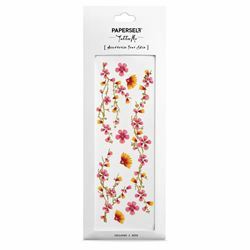 PAPERSELF paper eyelashes and unique temporary tattoos perfect for festivals, weddings and parties! 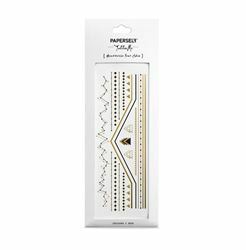 PAPERSELF are a London based brand and have become renowned as creators of the world’s leading paper lashes and designer of temporary tattoos. 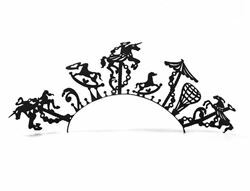 Originally inspired by the ancient art of paper cutting, PAPERSELF strive to give a modern twist to traditional culture by creating innovative products that cross the boundaries between art, fashion and beauty. Their paper lashes are unique and feature beautifully intricate designs letting you adorn your eyes with gorgeous storytelling lashes. In 2014 PAPERSELF launched their Tattoo Me collection, a line of artistic temporary tattoos. 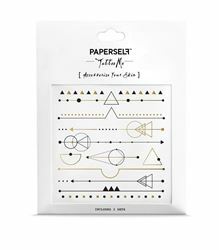 In keeping with their design-orientated approach, PAPERSELF tattoos focus on delicate and detailed designs with accents of bright colours and gold metallic. Their focus on the unconventional accessory has enabled them to create products that both surprise and inspire. 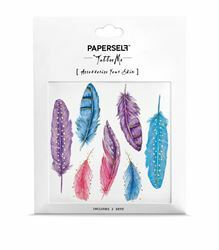 Stunning colour feather temporary tattoos! These fluffy feathers are hand drawn and painted with beautiful brush strokes and striking colours of blue, purple and pink. Gold metallic is added as an outline, highlighting the feather features! Apply these gorgeous feathers down your arm or neck. Wear one or wear them all!! This high quality and long lasting stick on tattoo looks elegant for any occasion! Snap a picture and tag your looks with #PAPERSELF to be featured on our social media! Follow us at @PAPERSELF for inspiration! Easy to apply! Just cut and wet with water! Remove gently with baby oil. Each tattoo pack contains 2 sheets. They last 2-4 days and are suitable for ages 3+ Non-toxic, safe and skin friendly. Manufactured in accordance with EU and US safety standards. Waterproof. Size 4"x4". Flower Script combines the ever popular floral and watercolour tattoo designs with beautiful and meaningful words to make you feel confident and dazzling. Each flower has a inspiring word to fill you with joy and inspire yourself and those around you! The flowers are: Destiny, Beloved, Beautiful, Imagine, Love, Grace and Happiness. 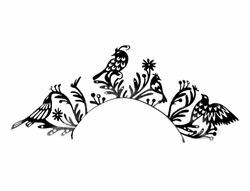 These long lasting, hand drawn and hand painted temporary tattoos are perfect for weddings, and hen parties! Our tattoos mix colour and metallic to create beautifully detailed striking designs on the skin. The perfect addition to any festival or party look! Snap a picture and tag your looks with #PAPERSELF to be featured on our social media! Follow us at @PAPERSELF for inspiration! To apply: Peel off plastic film and apply to clean, dry skin. Wet with water for 30 seconds and remove paper gently. To remove: soak for 10 seconds with baby oil. Gently wipe away oil and repeat until tattoo is completely dissolved. Never rub skin hard, as this may cause the skin to become red and sore. Warning: Do not apply to sensitive skin, near eyes or if allergic to adhesive. Easy to apply! Just cut and wet with water! Remove gently with baby oil. Each tattoo pack contains 2 sheets. They last 2-4 days and are suitable for ages 3+ Non-toxic, safe and skin friendly. Manufactured in accordance with EU and US safety standards. Waterproof. Size 4"x4". 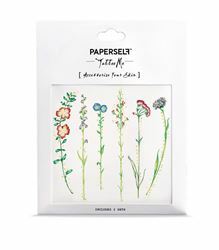 Wildflower temporary tattoo by PAPERSELF allows you to create beautiful realistic mini floral tattoos. Style as rings or behind the ear for a minimal accessory. 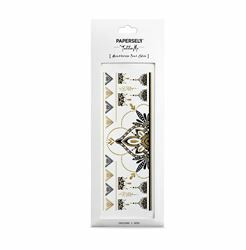 PAPERSELF tattoos mix colour and metallic to create beautifully detailed striking designs on the skin. The perfect addition to any festival or party look! Each design has multiple ways to apply so get creative with how you apply the tattoos! Cut anyway you want to make beautiful designs on the skin! To apply: Peel off plastic film and apply to clean, dry skin. Wet with water for 30 seconds and remove paper gently. To remove: soak for 10 seconds with baby oil. Gently wipe away oil and repeat until tattoo is completely dissolved. Never rub skin hard, as this may cause the skin to become red and sore. Warning: Do not apply to sensitive skin, near eyes or if allergic to adhesive. To apply: Peel off plastic film and apply to clean, dry skin. Wet with water for 30 seconds and remove paper gently. To remove: soak for 10 seconds with baby oil. Gently wipe away oil and repeat until tattoo is completely dissolved. Never rub skin hard, as this may cause the skin to become red and sore. Warning: Do not apply to sensitive skin, near eyes or if allergic to adhesive. The details: Each tattoo pack contains 2 sheets. They last 2-4 days and are suitable for ages 3+ Non-toxic, safe and skin friendly. Manufactured in accordance with EU and US safety standards. Waterproof. Pretty vintage flower temporary tattoos. 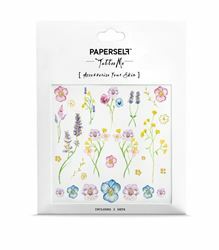 Designed to look like pressed flowers on the skin, these hand drawn designs feature pretty Forget-Me-Nots, Lavender and Cornflowers all with subtle hints of gold metallic to highlight the design. Part of our new collection - check it out here! PAPERSELF tattoos are artistically designed to create beautifully detailed, striking designs on the skin. Each design has multiple ways to apply so get creative with how you apply the tattoos! Cut anyway you want to make beautiful designs on the skin! To apply: Peel off plastic film and apply to clean, dry skin. Wet with water for 30 seconds and remove paper gently. To remove: soak for 10 seconds with baby oil. Gently wipe away oil and repeat until tattoo is completely dissolved. Never rub skin hard, as this may cause the skin to become red and sore. Warning: Do not apply to sensitive skin, near eyes or if allergic to adhesive. To apply: Peel off plastic film and apply to clean, dry skin. Wet with water for 30 seconds and remove paper gently. To remove: soak for 10 seconds with baby oil. Gently wipe away oil and repeat until tattoo is completely dissolved. Never rub skin hard, as this may cause the skin to become red and sore. Warning: Do not apply to sensitive skin, near eyes or if allergic to adhesive. The details: Each tattoo pack contains 2 sheets. They last 2-4 days and are suitable for ages 3+ Non-toxic, safe and skin friendly. Manufactured in accordance with EU and US safety standards. Waterproof. 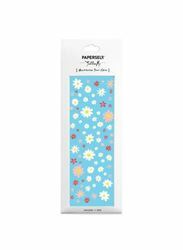 This delicate garden of pastel flowers will add a dainty touch to any look! These realistic looking temporary tattoos are perfect for those who like subtle and miniature tattoo body art! Perfect fake tattoos for adults! Perfect accessory for weddings and summer parties! Love this style? 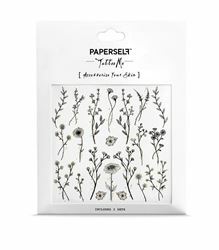 Then you will love PAPERSELF Wildflower tattoo check it out here. 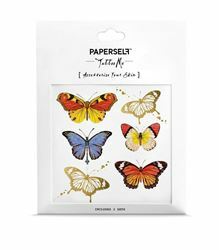 PAPERSELF tattoos mix colour and metallic to create beautifully detailed striking designs on the skin. The perfect addition to any festival or party look! Each design has multiple ways to apply so get creative with how you apply the tattoos! Cut anyway you want to make beautiful designs on the skin! To apply: Peel off plastic film and apply to clean, dry skin. Wet with water for 30 seconds and remove paper gently. To remove: soak for 10 seconds with baby oil. Gently wipe away oil and repeat until tattoo is completely dissolved. Never rub skin hard, as this may cause the skin to become red and sore. Warning: Do not apply to sensitive skin, near eyes or if allergic to adhesive. Easy to apply! Just cut and wet with water! Each tattoo pack contains 2 sheets. They last 2-4 days and are suitable for ages 3+ Non-toxic, safe and skin friendly. Manufactured in accordance with EU and US safety standards. Waterproof. Size 4"x4". Travel through the galaxy! 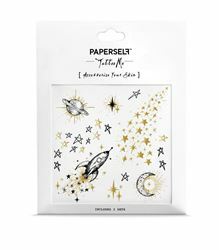 Perfect metallic gold star temporary tattoos with cute rocket and planets! 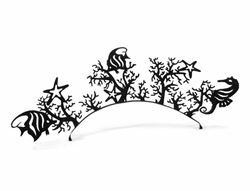 Cut out to wear a single star as a ring or combine for a larger look on the arm. Try out applying stars to the face for a super easy festival makeup look! The perfect addition to any festival or party look! Each design has multiple ways to apply so get creative with how you apply the tattoos! Cut anyway you want to make beautiful designs on the skin! Snap a picture and tag your looks with #PAPERSELF to be featured on our social media! Follow us at @PAPERSELF for inspiration! To apply: Peel off plastic film and apply to clean, dry skin. Wet with water for 30 seconds and remove paper gently. To remove: soak for 10 seconds with baby oil. Gently wipe away oil and repeat until tattoo is completely dissolved. Never rub skin hard, as this may cause the skin to become red and sore. Warning: Do not apply to sensitive skin, near eyes or if allergic to adhesive. Easy to apply! Just cut and wet with water! Remove gently with baby oil. Each tattoo pack contains 2 sheets. They last 2-4 days and are suitable for ages 3+ Non-toxic, safe and skin friendly. Manufactured in accordance with EU and US safety standards. Waterproof. Size 4"x4". 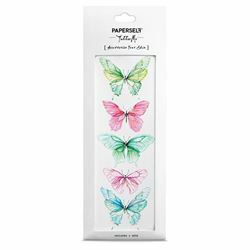 Beautiful Butterfly temporary tattoo designed by PAPERSELF is the perfect accessory for summer and festivals! With a mix of colour and gold metallic, these temporary tattoos will catch the attention of everyone you meet! You will be the envy of all of your friends! PAPERSELF tattoos mix colour and metallic to create beautifully detailed striking designs on the skin. Our tattoos are high quality and long lasting. The perfect addition to any festival or party look! Snap a picture and tag your looks with #PAPERSELF to be featured on our social media! Follow us at @PAPERSELF for inspiration! To apply: Peel off plastic film and apply to clean, dry skin. Wet with water for 30 seconds and remove paper gently. To remove: soak for 10 seconds with baby oil. Gently wipe away oil and repeat until tattoo is completely dissolved. Never rub skin hard, as this may cause the skin to become red and sore. Warning: Do not apply to sensitive skin, near eyes or if allergic to adhesive. Easy to apply! Just cut and wet with water! Remove gently with baby oil. Each tattoo pack contains 2 sheets. They last 2-4 days and are suitable for ages 3+ Non-toxic, safe and skin friendly. Manufactured in accordance with EU and US safety standards. Waterproof. Size 4"x4". A bestseller, our Constellation tattoos add a elegant touch with their minimal geometric look. For a more realistic tattoo look apply a small amount of hand cream 1 minute after you apply your tattoo to mattify the design. 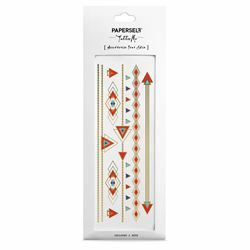 PAPERSELF tattoos mix colour and metallic to create beautifully detailed striking designs on the skin. The perfect addition to any festival or party look! Each design has multiple ways to apply so get creative with how you apply the tattoos! Cut anyway you want to make beautiful designs on the skin! Snap a picture and tag your looks with #PAPERSELF to be featured on our social media! Follow us at @PAPERSELF for inspiration! To apply: Peel off plastic film and apply to clean, dry skin. Wet with water for 30 seconds and remove paper gently. To remove: soak for 10 seconds with baby oil. Gently wipe away oil and repeat until tattoo is completely dissolved. Never rub skin hard, as this may cause the skin to become red and sore. Warning: Do not apply to sensitive skin, near eyes or if allergic to adhesive. Easy to apply! Just cut and wet with water! Remove gently with baby oil. Each tattoo pack contains 2 sheets. They last 2-4 days and are suitable for ages 3+ Non-toxic, safe and skin friendly. Manufactured in accordance with EU and US safety standards. Waterproof. Size 4"x4". 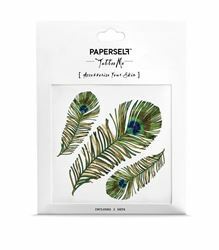 Peacock Feather temporary tattoo by PAPERSELF features colour and metallic to create a striking feather design on the skin. The rich, realistic colour and addition of gold metallic as highlight makes it the perfect accessory for a festival or party look! Get adventurous! Style down the next for a unique look! PAPERSELF tattoos mix colour and metallic to create beautifully detailed striking designs on the skin. The perfect addition to any festival or party look! Each design has multiple ways to apply so get creative with how you apply the tattoos! Cut anyway you want to make beautiful designs on the skin! Snap a picture and tag your looks with #PAPERSELF to be featured on our social media! Follow us at @PAPERSELF for inspiration! To apply: Peel off plastic film and apply to clean, dry skin. Wet with water for 30 seconds and remove paper gently. To remove: soak for 10 seconds with baby oil. Gently wipe away oil and repeat until tattoo is completely dissolved. Never rub skin hard, as this may cause the skin to become red and sore. Warning: Do not apply to sensitive skin, near eyes or if allergic to adhesive. Easy to apply! Just cut and wet with water! Remove gently with baby oil. Each tattoo pack contains 2 sheets. They last 2-4 days and are suitable for ages 3+ Non-toxic, safe and skin friendly. Manufactured in accordance with EU and US safety standards. Waterproof. Size 4"x4". Our Koi tattoo is a favourite! So elegant on, the subtle hints of gold metallic create detail and catch the light when worn. A sure head turner! 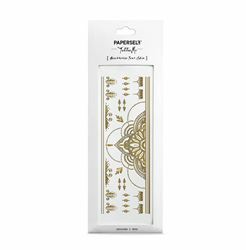 Long lasting and realistic temporary tattoo with accents of gold metallic to create a beautifully detailed striking design on the skin. The perfect addition to any festival or party look! Snap a picture and tag your looks with #PAPERSELF to be featured on our social media! Follow us at @PAPERSELF for inspiration! To apply: Peel off plastic film and apply to clean, dry skin. Wet with water for 30 seconds and remove paper gently. To remove: soak for 10 seconds with baby oil. Gently wipe away oil and repeat until tattoo is completely dissolved. Never rub skin hard, as this may cause the skin to become red and sore. Warning: Do not apply to sensitive skin, near eyes or if allergic to adhesive. Easy to apply! Just cut and wet with water! Remove gently with baby oil. Each tattoo pack contains 2 sheets. They last 2-4 days and are suitable for ages 3+ Non-toxic, safe and skin friendly. Manufactured in accordance with EU and US safety standards. Waterproof. Size 2.5"x7". Calling all perfectly crazy cat lovers! This cute kitty looks incredible on, your perfect regal friend! 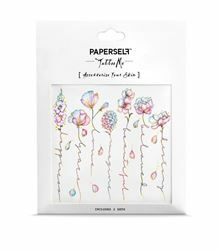 PAPERSELF tattoos mix colour and metallic to create beautifully detailed striking designs on the skin. The perfect addition to any festival or party look! Each design has multiple ways to apply so get creative with how you apply the tattoos! Cut anyway you want to make beautiful designs on the skin! Easy to apply! Just cut and wet with water! Each tattoo pack contains 2 sheets. They last 2-4 days and are suitable for ages 3+ Non-toxic, safe and skin friendly. Manufactured in accordance with EU and US safety standards. Waterproof. Size 2.5"x7". Part of the transparent range, these semi see through jellyfish are inspired by nature. 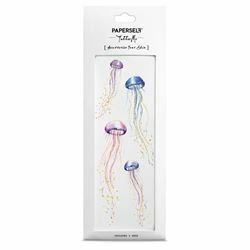 Highly detailed and intricately designed PAPERSELF Jellyfish tattoos are a unique accessory to any outfit. The addition of gold metallic is used to highlight the design so it catches the light as you move, like jellyfish glistening in the sea... Part of our new collection - check it out here! PAPERSELF tattoos are artistically designed to create beautifully detailed, striking designs on the skin. Each design has multiple ways to apply so get creative with how you apply the tattoos! Cut anyway you want to make beautiful designs on the skin! Snap a picture and tag your looks with #PAPERSELF to be featured on our social media! Follow us at @PAPERSELF for inspiration! To apply: Peel off plastic film and apply to clean, dry skin. Wet with water for 30 seconds and remove paper gently. To remove: soak for 10 seconds with baby oil. Gently wipe away oil and repeat until tattoo is completely dissolved. Never rub skin hard, as this may cause the skin to become red and sore. Warning: Do not apply to sensitive skin, near eyes or if allergic to adhesive. Easy to apply! Just cut and wet with water! Remove gently with baby oil. Each tattoo pack contains 2 sheets. They last 2-4 days and are suitable for ages 3+ Non-toxic, safe and skin friendly. Manufactured in accordance with EU and US safety standards. Waterproof. Size 2.5"x7". Golden Age temporary tattoo features minimal geometric shapes. Create unique tattoo designs and customise your body art! Create bracelets, chokers, rings and more! The perfect addition to any festival or party look! Each design has multiple ways to apply so get creative with how you apply the tattoos! Cut anyway you want to make beautiful designs on the skin! Easy to apply! Just cut and wet with water! Remove gently with baby oil. Each tattoo pack contains 2 sheets. They last 2-4 days and are suitable for ages 3+ Non-toxic, safe and skin friendly. Manufactured in accordance with EU and US safety standards. Waterproof. Size 2.5"x7". The perfect accessory to any festival outift! An all gold version of the classic henna tattoo designs! Get creative and customise your perfect henna tattoo design perfect for festivals and summer parties! Cut out little pieces to style as finger tattoo rings! 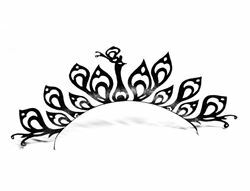 Love this design check out our Henna Black temporary tattoos here! PAPERSELF tattoos mix colour and metallic to create beautifully detailed striking designs on the skin. The perfect addition to any festival or party look! Each design has multiple ways to apply so get creative with how you apply the tattoos! Cut anyway you want to make beautiful designs on the skin! Snap a picture and tag your looks with #PAPERSELF to be featured on our social media! Follow us at @PAPERSELF for inspiration! Easy to apply! Just cut and wet with water! Remove gently with baby oil. Each tattoo pack contains 2 sheets. They last 2-4 days and are suitable for ages 3+ Non-toxic, safe and skin friendly. Manufactured in accordance with EU and US safety standards. Waterproof. Size 2.5"x7". Henna Black temporary tattoo, hand drawn and long lasting temporary henna art. Get creative and customise your perfect henna tattoo design perfect for festivals and summer parties! Cut out little pieces to style as finger tattoo rings! Love this design check out our all gold henna here! 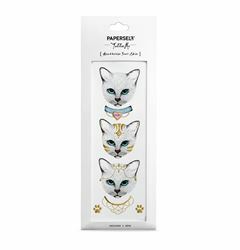 PAPERSELF tattoos mix colour and metallic to create beautifully detailed striking designs on the skin. The perfect addition to any festival or party look! Each design has multiple ways to apply so get creative with how you apply the tattoos! Cut anyway you want to make beautiful designs on the skin! Snap a picture and tag your looks with #PAPERSELF to be featured on our social media! Follow us at @PAPERSELF for inspiration! Easy to apply! Just cut and wet with water! Remove gently with baby oil. Each tattoo pack contains 2 sheets. They last 2-4 days and are suitable for ages 3+ Non-toxic, safe and skin friendly. Manufactured in accordance with EU and US safety standards. Waterproof. Size 2.5"x7". Customisable! Wear as a bracelet, necklace, hand chain, ring... the possibilities are endless...! Perfect for festivals for a boho accessory that is completely customisable! PAPERSELF tattoos mix colour and metallic to create beautifully detailed striking designs on the skin. Each design has multiple ways to apply so get creative with how you apply the tattoos! Cut anyway you want to make beautiful designs on the skin! Snap a picture and tag your looks with #PAPERSELF to be featured on our social media! Follow us at @PAPERSELF for inspiration! Easy to apply! Just cut and wet with water! Remove gently with baby oil. Each tattoo pack contains 2 sheets. They last 2-4 days and are suitable for ages 3+ Non-toxic, safe and skin friendly. Manufactured in accordance with EU and US safety standards. Waterproof. Size 2.5"x7". One of our best sellers! Totally customisable, wear wrapped around the wrist or trailing down the back... Pink cherry blossom temporary tattoos. This high quality body art will be sure to turn heads! PAPERSELF tattoos mix colour and metallic to create beautifully detailed striking designs on the skin. The perfect addition to any festival or party look! Each design has multiple ways to apply so get creative with how you apply the tattoos! Cut anyway you want to make beautiful designs on the skin! Snap a picture and tag your looks with #PAPERSELF to be featured on our social media! Follow us at @PAPERSELF for inspiration! To apply: Peel off plastic film and apply to clean, dry skin. Wet with water for 30 seconds and remove paper gently. To remove: soak for 10 seconds with baby oil. Gently wipe away oil and repeat until tattoo is completely dissolved. Never rub skin hard, as this may cause the skin to become red and sore. Warning: Do not apply to sensitive skin, near eyes or if allergic to adhesive. Easy to apply! Just cut and wet with water! Remove gently with baby oil. Each tattoo pack contains 2 sheets. They last 2-4 days and are suitable for ages 3+ Non-toxic, safe and skin friendly. Manufactured in accordance with EU and US safety standards. Waterproof. Size 2.5"x7". Hippie Daisy, the prettiest temporary tattoo around! This amazing white temporary tattoo with pink and red flowers looks incredible on all skin tones. Trail down your arms or wear across your face for a cute boho look. Long lasting and easy to apply. Snap a picture and tag your looks with #PAPERSELF to be featured on our social media! Follow us at @PAPERSELF for inspiration! To apply: Peel off plastic film and apply to clean, dry skin. Wet with water for 30 seconds and remove paper gently. To remove: soak for 10 seconds with baby oil. Gently wipe away oil and repeat till tattoo is completely dissolved. If applying to your face be gentle when removing with baby oil, be gentle around eye area as this is most sensitive. Warning: Do not apply to sensitive skin, near eyes or if allergic to adhesive. Each tattoo pack contains 2 sheets. They last 2-4 days and are suitable for ages 3+ Non-toxic, safe and skin friendly. Manufactured in accordance with EU and US safety standards. Waterproof. Size 2.5"x7". A unique take on the traditional dream catcher temporary tattoo. With delicate gold metallic dots and hand painted watercolour feathers, these stunning dream catcher tattoos can be worn together or separately. Customise your own tattoo design by decorating with watercolour flowers. A beautiful tattoo with a meaning. Dream catchers are lucky talismans that protect you from bad dreams... This long lasting and realistic stick on tattoo transfer will add something special to your look. Wear on a special occasion or wear everyday, this tattoo will turn heads now matter when you wear it! Snap a picture and tag your looks with #PAPERSELF to be featured on our social media! Follow us at @PAPERSELF for inspiration! Easy to apply! Just cut and wet with water! Remove gently with baby oil. Each tattoo pack contains 2 sheets. They last 2-4 days and are suitable for ages 3+ Non-toxic, safe and skin friendly. Manufactured in accordance with EU and US safety standards. Waterproof. Size 2.5"x7". Beautiful new Butterfly temporary tattoo! 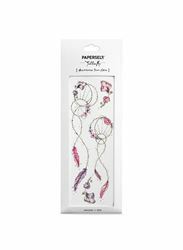 These delicate tattoos are semi-transparent creating a beautiful layer effect when worn and inspired by the delicate butterfly wings. With subtle accents of gold metallic and NEW white ink highlight these tattoos are perfect for your summer style! Part of our new collection - check it out here! 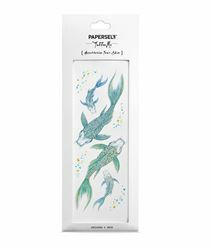 PAPERSELF tattoos are artistically designed to create beautifully detailed, striking designs on the skin. Each design has multiple ways to apply so get creative with how you apply the tattoos! Cut anyway you want to make beautiful designs on the skin! Snap a picture and tag your looks with #PAPERSELF to be featured on our social media! Follow us at @PAPERSELF for inspiration! To apply: Peel off plastic film and apply to clean, dry skin. Wet with water for 30 seconds and remove paper gently. To remove: soak for 10 seconds with baby oil. Gently wipe away oil and repeat until tattoo is completely dissolved. Never rub skin hard, as this may cause the skin to become red and sore. Warning: Do not apply to sensitive skin, near eyes or if allergic to adhesive. Easy to apply! Just cut and wet with water! Remove gently with baby oil. Each tattoo pack contains 2 sheets. They last 2-4 days and are suitable for ages 3+ Non-toxic, safe and skin friendly. Manufactured in accordance with EU and US safety standards. Waterproof. Size 2.5"x7". Want to be a mermaid IRL?! Our Under the Sea lashes are perfect for any wannabe mermaid! Create a unique Halloween costume with our paper lashes! PAPERSELF are the world leaders and inventors of the paper lash. Our lashes are the first of their kind and feature beautifully intricate designs letting you adorn your eyes with gorgeous storytelling lashes! Designed to be cut, each lash can be cut into smaller pieces to make multiple unique looks! Made from extremely light special paper material so virtually weightless to wear! Glue is not included. A best seller and featured in The Hunger Games Movies worn by Elizabeth Banks as Effie Trinket! The perfect accessory to add to you Hunger Games cosplay or fancy dress as these are the exact lashes worn by Effie Trinket! PAPERSELF are the world leaders and inventors of the paper lash. Our lashes are the first of their kind and feature beautifully intricate designs letting you adorn your eyes with gorgeous storytelling lashes! Design patented worldwide! Made from extremely light special paper material so virtually weightless to wear! Glue is not included. How to apply: Gently remove lashes using your finger or tweezers. Shape the lash band to give it a curve. Lashes can be applied in full or cut into mini lashes to accentuate the outer corners of the eye. Apply a thin layer of glue along the lash band and wait a few seconds for the glue to become tacky. Place lashes slightly above the natural lash line. If using the full lash apply from inner to the outer corners of the eye. If using the mini lash, apply onto the outer corners to accentuate your eyes! Gently press down to set. To remove, gently peel off. Why not check out our Deer and Butterfly lashes also worn by Effie or our Peacock paper lashes worn by Jennifer Lawrence as Katniss Everdeen! PAPERSELF Deer and Butterfly paper lashes are very easy to apply for a pretty soft look with dainty butterflies on your eyes for the ultimate boho festival party makeup look! 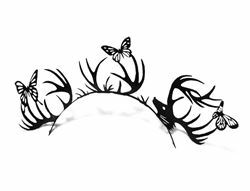 Our Deer and Butterfly lashes are a celebrity favourite! 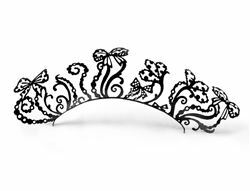 Worn by Anne Hathaway on the red carpet and Elizabeth Banks as Effie Trinket in the Hollywood hit 'The Hunger Games'! The perfect accessory to add to you Hunger Games cosplay or fancy dress as these are the exact lashes worn by Effie Trinket! Why not check out our Birds lashes also worn by Effie or our Peacock paper lashes worn by Jennifer Lawrence as Katniss Everdeen! PAPERSELF are the world leaders and inventors of the paper lash. Our lashes are the first of their kind and feature beautifully intricate designs letting you adorn your eyes with gorgeous storytelling lashes! Designed to be cut, each lash can be cut into smaller pieces to make multiple unique looks! Made from extremely light special paper material so virtually weightless to wear! Glue is not included. Beautiful peacock feather paper lashes! The perfect pair if you have never tried our paper lashes before as they are very easy to apply and allow you to play around creating a subtle or more dramatic look. Check out our tutorial on our homepage to see how to apply! As seen in the Hollywood hit 'The Hunger Games' worn by Jennifer Lawrence as Katniss Everdeen! Also worn by Rihanna! The perfect accessory to add to you Hunger Games cosplay or fancy dress as these are the exact lashes worn by Jennifer Lawrence as Katniss Everdeen! Why not check out our Deer and Butterfly lashes or our Bird paper lashes worn by Elizabeth Banks as Effie Trinket in the Hunger Games! About: PAPERSELF are the world leaders and inventors of the paper lash. Our lashes are the first of their kind and feature beautifully intricate designs letting you adorn your eyes with gorgeous storytelling lashes! Designed to be cut, each lash can be cut into smaller pieces to make multiple unique looks! Made from extremely light special paper material so virtually weightless to wear! How to wear: Gently remove lashes using your finger or tweezers. Shape the lash band to give it a curve. Lashes can be applied in full or cut into mini lashes to accentuate the outer corners of the eye. Apply a thin layer of glue along the lash band and wait a few seconds for the glue to become tacky. Place lashes slightly above the natural lash line. If using the full lash apply from inner to the outer corners of the eye. If using the mini lash, apply onto the outer corners to accentuate your eyes! Gently press down to set. To remove, gently peel off. Glue is not included. Style up your eyes with these super cute pop art bows! Apply one bow to the corners of your eye for a playful flutter look! About: PAPERSELF are the world leaders and inventors of the paper lash. Our lashes are the first of their kind and feature beautifully intricate designs letting you adorn your eyes with gorgeous storytelling lashes! Designed to be cut, each lash can be cut into smaller pieces to make multiple unique looks! Made from extremely light special paper material so virtually weightless to wear! How to wear: Gently remove lashes using your finger or tweezers. Shape the lash band to give it a curve. Lashes can be applied in full or cut into mini lashes to accentuate the outer corners of the eye. Apply a thin layer of glue along the lash band and wait a few seconds for the glue to become tacky. Place lashes slightly above the natural lash line. If using the full lash apply from inner to the outer corners of the eye. If using the mini lash, apply onto the outer corners to accentuate your eyes! Gently press down to set. To remove, gently peel off. Glue is not included. Round and round we go on this beautiful carousel! A fairground inspired paper lash! Think of pretty carousels in Paris with all it's magic and wonder! About: PAPERSELF are the world leaders and inventors of the paper lash. Our lashes are the first of their kind and feature beautifully intricate designs letting you adorn your eyes with gorgeous storytelling lashes! Designed to be cut, each lash can be cut into smaller pieces to make multiple unique looks! Made from extremely light special paper material so virtually weightless to wear! How to wear: Gently remove lashes using your finger or tweezers. Shape the lash band to give it a curve. Lashes can be applied in full or cut into mini lashes to accentuate the outer corners of the eye. Apply a thin layer of glue along the lash band and wait a few seconds for the glue to become tacky. Place lashes slightly above the natural lash line. If using the full lash apply from inner to the outer corners of the eye. If using the mini lash, apply onto the outer corners to accentuate your eyes! Gently press down to set. To remove, gently peel off. Glue is not included.